A Midland academic has hit out at a supermarket giant for using the poignant First World War Christmas Truce to "sell groceries". The advert from Sainsbury&apos;s, which has been backed by the Royal British Legion, has largely been praised, but Gary Sheffield, Professor of war studies at the University of Wolverhampton said he felt it was not appropriate. And Prof Sheffield questioned "myth making" around the event, held on Christmas Day 1914, saying that there was "scant evidence" that a football match even took place. The widely believed events are said to have begun on Christmas Eve, and in the week leading up to it, when German and British soldiers are said to have crossed trenches to chat and swap food and souvenirs. It was also said be a time when bodies in No Man&apos;s Land were collected, carols were sung and even football matches took place. But the Sainsbury&apos;s advert has prompted 727 complaints to the Advertising Standards Authority, mostly about promoting products against the backdrop of a tragic conflict, but the body has said it will not investigate, claiming it broke no rules. It has now had more than 15 million views on YouTube. Prof Sheffield said: "My personal view is that I don&apos;t think it is appropriate and that I am uneasy at using the First World War to sell groceries, no matter how sensitively it is done or that it involves giving some monies to the Royal British Legion. I simply don&apos;t like it. "This year the First World War has received huge publicity and from a commercial point of view it is not surprising that firms such as Sainsbury&apos;s are cashing in on the public interest. "This interest is in many ways a double-edged sword – it is great that many people have discovered for the first time or rediscovered the First World War. There has been lots of great work at a local level with exhibitions and the like. "But the downside to that is that a bandwagon has been created leading to myths being restated and gaining popularity such as the supposedly central place football played in the Christmas truce." However, Prof Sheffield did say that he was impressed with the level of historical accuracy in general in the advert, although he has problems with the amount of football played. He said: "It is a lot more accurate than it could have been because, I understand, of the involvement of a historical adviser who knows his stuff and was able to get the makers to tone down the football element so as to include some of the more mundane things that took place – such as the soldiers showing each other photographs. "The role of football in the truce is very much overhyped. There is a common assumption that some sort of big match took place but there is scant evidence of this actually occurring. "Most of the evidence is hearsay or soldiers recounting they were going to have a match but didn&apos;t have a ball or their superiors forbade it. It is possible that some sort of low-level kick-about took place but not much more. "Football has become emblematic of the truce and distracts the attention away from why the truce was important. "Some Great War veterans, old soldiers I have spoken to, even refused to believe it had taken place." TV critic Charlie Brooker also had problems with the advert, saying: "It&apos;s all very poignant, if you mentally delete the bit where a supermarket logo hovers over the killing fields, which you can&apos;t. Millions of young men were slaughtered during the First World War. "It would have been a great source of comfort for them to know their noble sacrifice would still be honoured a century later, in an advert for a shop." Charles Byrne, director of fundraising for The Royal British Legion, said: "We&apos;re very proud of our 20-year partnership with Sainsbury&apos;s and this campaign is particularly important. 100 years on from the 1914 Christmas truce, the campaign remembers the fallen, while helping to raise vital funds to support the future of living." A Sainsbury&apos;s spokesman added: "Christmas is a special time of year when people pause to reflect on what&apos;s important. "More than any other time of year, people come together to share simple moments and kindnesses. 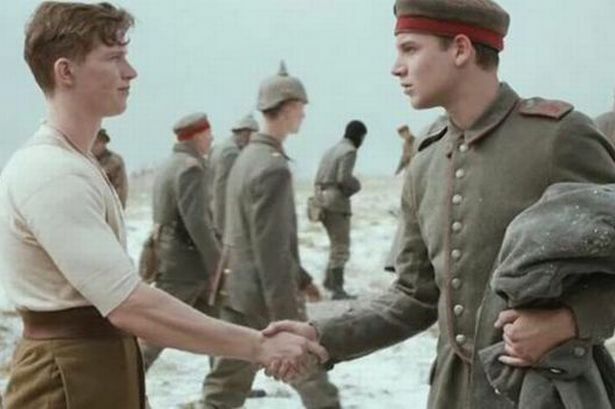 "This year, we wanted to reflect that theme of sharing in our Christmas campaign through the lens of one of the most extraordinary moments of sharing in modern history, when on Christmas Day 1914, British and German soldiers paused, laid down their arms, and came together on neutral territory to share by singing, exchanging mementoes and even a game of football. "The Christmas truce is an emotive and cherished story in our history that is especially poignant in this First World War centenary year. "That&apos;s why we have worked together closely with The Royal British Legion to bring this moment to life with authenticity and respect."